Everyone knows Tech has led the stock market higher since Trump was elected and 2018 has again demonstrated strong tech leadership. The resplendent tech vanguard is dominated by the $3.3+ Trillion behemoths under the Jim Cramer acronym known as FAANG (Facebook, Amazon, Apple, Netflix, and Google). 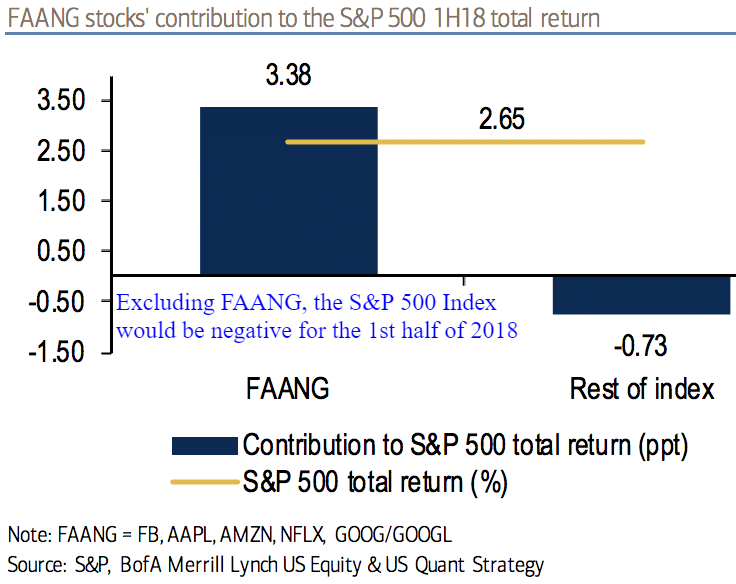 The tech-heavy Nasdaq is up double digits in 2018, yet the broader stock market would be negative without FAANG. The economy, optimism, and tech stocks have remained connected and all are very elevated. A China-US trade impasse is the primary economic and stock market concern in 2018. However, Trump’s multi-pronged stimulus through individual and corporate tax cuts, repatriation, deregulation and major energy stimulus along with his emotional backing of domestic business have coincided with accelerating economic growth and persistent record optimism. 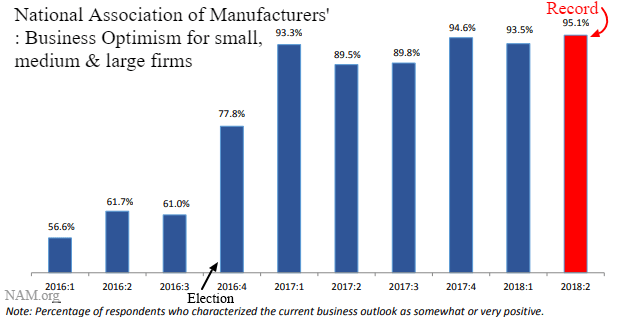 Manufacturers’ optimism hit an all-time high of 95.1%, according to the National Association of Manufacturers (NAM) 2nd quarter 2018 survey. This was the highest rating in the NAM’s 20 year history. Large Manufacturers have been particularly ecstatic with 97.9% of companies optimistic. The breakdown of the survey topics was broad-based with impressive responses throughout. Expected Growth Rate for Sales over the Next 12 Months is↑ 5.7% — a record. Expected Growth Rate for Full-Time Employment over the Next 12 Months is↑ 3.1% — an all-time high. Expected Growth Rate for Employee Wages over the Next 12 Months is ↑ 2.7% — highest in over 17 years. Expected Growth Rate for Capital Investments over the Next 12 Months is ↑ 4.1% — all-time high. The caveat is that Manufacturing companies cite trade worries and political uncertainty as to their biggest concerns. This uncertainty is already modestly cooling robust demand and should lead to softer GDP growth (<4%) until Trade Deals are confirmed. 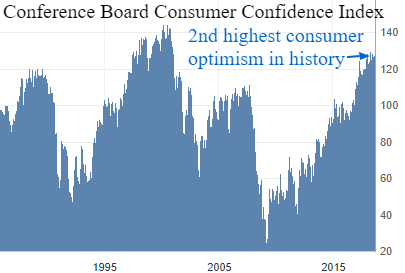 Along with record Business confidence and superb manufacturing expansion rates, the main driver of US GDP growth has been the spending and confidence from consumers. 2018 is witnessing the 2nd strongest period in the 48-year history of the survey, surpassed only by the Tech boom of the 1990’s. While star FAANG stock performers, Netflix and Facebook have fallen over 20% from their recent highs, the Tech-heavy Nasdaq is only off 4% from last weeks record peak and remains in a strong growth phase that is being justified with excellent GDP expansion rates far above the sluggish period of the 2009 – 2016. Netflix and Facebook are FAANG’s smaller sister’s and have registered rare disappointing quarterly reports recently, yet tech in general and the rest of FAANG remain exceptionally strong thus far. Today Apple’s stock ticked within 1% of the $1 Trillion value milestone. With the elevated stock market in 2017 and the huge buffer of business and consumer tax cuts along with capital repatriation, Trump used this buffer to pursue the risk of a partial Trade War to feather his cap with another campaign pursuit of smaller US trade deficits. The metrics have worked for Trump to date and the markets ability to withstand his threats and disappointment form cloud kings such as Facebook and Netflix is impressive. Without a severe escalation of Trade Tariffs and shortfalls from FAANG leaders Apple and Amazon, there is no reason yet to expect significant market corrections or pessimism to arise. We continue to expect a slowing uptrend in Tech with a sideways broader market until an outcome in the Trade War saga becomes clear. A full-blown Trade War we still feel is an extremely low odds outcome, but Trump will keep escalating until he acquires a major concession.